I was lounging in my hammock, downloading a book to my e-reader (The Collected Works of Shakespeare, if you’re interested), when I realized that it had been a long time since I’d been in a bookstore. I got to thinking and realized that it had also been a long time since I’d been in a music store. A bit more thinking (sometimes I think that much, it’s true) and I realized that it had been a really, really, really, really, really long time since I’d been in a movie rental place. Over the past couple of years, I’ve gotten used to getting most of my entertainment from the internet (motto: Going without a capital “I” in Wired Magazine since 2004). I ordered my books from Amazon. I ordered my DVDs from Amazon. I ordered my music from Amazon. Well, okay, I also ordered my music from iTunes. Well, okay, I mostly ordered my music from garage sales happening on nearby streets. Well, fine then, the garage sales didn’t really take my order, but you get the idea. I used to love going to bookstores. When I was a kid and we’d go, I’d spend what felt like hours working my way through the shelves, pulling out books with their shiny spines, drooling slack-jawed over the glossy cover art, devouring the back cover blurbs. Sometimes, I’d even buy one (rather, my mom would buy one for me). Later on in life, I haunted both the big chain new book bookstores and the small, corner-shop used bookstores. In the one, I loved the bright lights, the unbroken spines of all those new books. In the other, I loved the smell of paper, the dimness of the shadowy corridors that seemed to promise secrets to be found — and the cheap prices (hey, I was on a budget). I never loved going into music stores as much as bookstores, but especially during my graduate school years, I’d go into one once or twice a week looking for a cd. I’d flip through the collections, take a couple up to the listening counter, slap some headphones on, and find out if I was going to have a new favorite group (it’s still the band Garbage, if you were wondering). My DVD collection numbers 400 or so boxes (many are TV series). It was my great pleasure to wander into the local used DVD store and browse through until I found some horrifyingly bad horror movie and then buy it for a couple of bucks. So what happened? The 21st Century, mostly. When Amazon, founded in 1994, started selling, well, darned near everything in the early 2000s, it was just ridiculously easy to go online, make a couple of mouse clicks, and wait for the mailman to deliver my goodies. In that one place I could get movies, music, books. Heck, I could get posters, blankets, and, if I really wanted it, a Roomba robotic vacuum cleaner. Amazon was like the Home Shopping Network, but not as noisy, and with better decor. Even more convenient was iTunes, Apple’s online music store. With even fewer clicks I could have individual songs or whole albums electronically sent right to my computer. But Amazon and iTunes weren’t the end of it. Even having those services, I’d still occasionally go to anactual brick-and-mortar store to pick up a book or a DVD (and blankets, for that matter). Until this year. This year, two new things-of-note entered my life: 1). Netflix. 2). Nook. 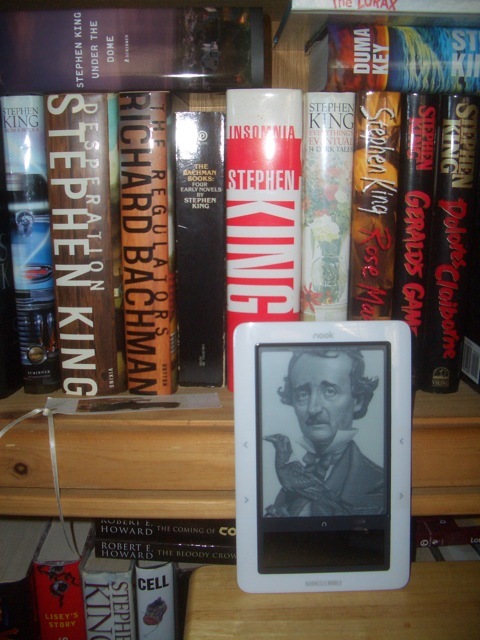 A Nook posing with some of its non-technological ancestors. Nook is my e-book reader (it’s distributed by Barnes and Noble; Kindle, Amazon’s e-book reader, is Nook’s more famous cousin). I’ve named my Nook “Fluffy,”even though it’s, well, not. I turn Fluffy on, log on to the Barnes and Noble online store, and download books — many for free, most for a reasonably low price. With a little more effort I can go to my computer and download books from pretty much anywhere online, then transfer them over to Fluffy to be read at my convenience. I never have to leave my hammock. When I was driving around the other day just for fun — since I don’t actually have to leave the house to do any shopping or anything — I drove past a used bookstore I had frequented a great deal in the past. On a whim, I wheeled into the parking lot and walked in. There it was, that smell of old books on weathered shelves. It was heavenly. I walked over to a section and pulled out a couple at random. So I didn’t buy anything. Not that I won’t ever buy a paper book now and then. After all, if I drop Fluffy while reading in the bathtub, I’ll likely be electrocuted. The author has yet to be electrocutedby any of his electronic gadgetry. If you’d like to wish him continued unelectrocutedness, feel free. He would also like to welcome his soon-to-be new WordPress readers. Howdy. This entry was posted in Observation Deck and tagged books, e-books, e-readers, Kindle, Netflix, Nook. Bookmark the permalink.